Why make content marketing interactive? You've probably noticed how much more content your own content has to compete with. That's the challenge of content marketing and having to feed the content monster with even more and better content to stand out. That's also where interaction can help. "A marketing app might be an assessment tool, to help someone understand which stage their company is at in a maturity model for a new technology. A marketing app might be a game-like quiz show to debunk popular myths around a product category. A marketing app might be an interactive e-book that embeds real-time polls, adjustable data visualizations, and an ROI calculator." These apps transform passive content into engaging experiences that "take inspiration from the two-way conversations of great salespeople and the active learning techniques demonstrated by great teachers." They also enable a different model for generating leads: engage with prospect in a participatory way first with an interactive content assessment. If the prospect considers your experience worth learning more about, s/he provides you with an email address and you further develop the relationship. When do you use interactive content? 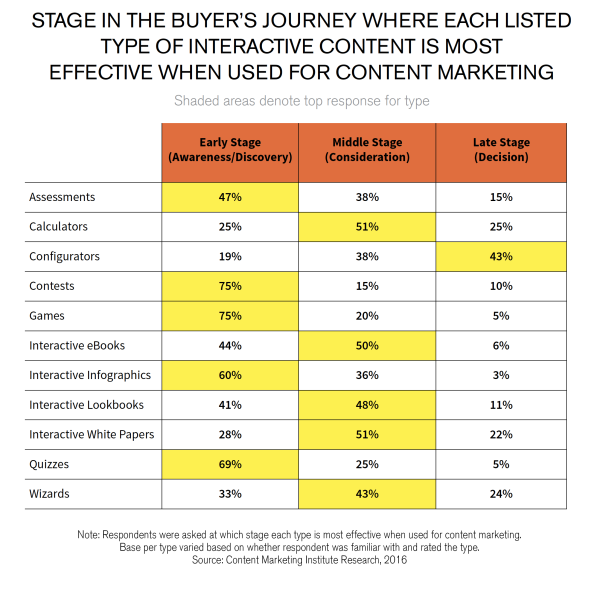 According to Content Marketing Institute's Use of Interactive Content on the Rise [Research], you can use interactive content at any stage of the buyer's journey. Per the research, the top reason for interaction has to do with education (75%), then engagement (59%). And the top mentioned type is an interactive content assessment (54%), then calculators (52%) and contests (50%). What kinds of interactive tools generate qualified leads? Assessments - Through a series of questions, users are bucketed into one of several categories. As Scott Brinker mentioned above, interactive content is "a way to have a conversation with your audience. Interactivity brings the dynamism and persuasive power of an in-person interaction to a landing page, blog, email, paid media ad – or anywhere else you might find your audience." It can also inject personalization as you gather more information about your prospects. What is an interactive content assessment? Assessments are powerful for both the prospect and the marketer. You can easily envision using an assessment as the basis for a one-on-one conversation. As a result of questions and answers, both parties gain more insight about one-another. In looking at the Content Marketing Institute listing of interactive content options and comparing them to the SnapApp listing, you might combine Configurators and Wizards with Assessments as they all equally help categorize a prospect's options. What about the future of interactive content? "Interactive content is any user experience (commonly a web-based tool or microsite) that has an interactive element and allows the user to participate in the content and find out some useful answers or results. The best examples of interactive content marketing solve problems first and are content marketing campaigns second. If you are developing interactive content, it’s best to gauge success by total shares or average session time instead of click-through rate. Just keep in mind that it’s not about you, and it’s not about direct lead generation. It’s about providing value to an audience. Good interactive content marketing doesn’t use pop-up solicitations, aggressive CTAs, or underhanded sales pitches." For additional perspective on why, think how the interactive aspect delivers data on your prospect which you can combine with behavioral information (assuming good website analytic and marketing automation tools). In so doing, you deliver a personalized experience based on context that respects the time a prospect has shared with you. That is a sure way to develop a long-term relationship. "Companies that are able to find a way to integrate big data insights into real world content applications, with an emphasis on catering to the individual user, will win out in the next phase of marketing evolution." He encourages developing content that's open-ended (see Steve Rubel Talks Inbound Content Challenges at #INBOUND15), understanding your customers better with qualitative and quantitative data, and encouraging more user-generated perspective all of which you can get started with now. Start thinking how to show rather than only tell. What works for interactive content and lead generation? "Quizzes and assessments, for sure. Why? They allow the reader to make the content their own. Instead of the same content for everyone, an interactive piece personalizes the advice for the specific visitor. It's not one-size-fits-all content." "Having a valid reason to interact with both customers and future prospects can be invaluable, and showing that you want to listen to people - rather than just talk at them - is also a great way to build a relationship." 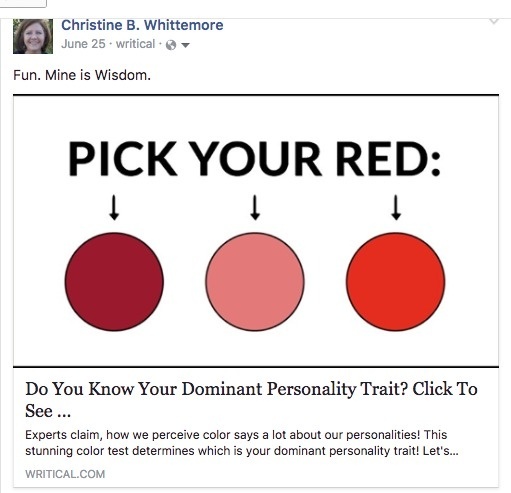 "Quizzes are key because they allow everyone a way to clearly articulate and compare their personal pain point while helping them feel that they aren't alone..."
"The one that has the most success is webinars. They allow us to dig deep into our capabilities while also giving the viewer a chance to ask questions. It's almost like having a needs analysis meeting without them feeling the pressure of moving forward." "...A key aspect of this activity is that it returns nice, warm leads, as people do have to give up some time to take part in the calculators, which is a great indication of real interest in what you're offering." What are best practices for interactive tools? The best way to generate qualified leads with an interactive tool is by spending a great deal of time upfront thinking about your customers and their questions and how your offerings fit into the responses. Ensure it integrates fully with the rest of your marketing. There’s something about a good interactive experience that delights while delivering value to both the user and the business. I find examples helpful. The most grounding are ones that aren't necessarily new or digital, yet they captivate your attention. When you understand what about those examples was compelling, you can apply that to your own projects. Do you remember S&H Green Stamps? It was a successful rewards program tied to consumer purchases. What about an Advent Calendar where, by opening up a window, you receive an image, saying or sweet to inspire good thoughts ahead of a religious event. A fascinating interactive content assessment is one LostGolfBalls.com created and documented in How We Created an Online Assessment that Helped Increase Website Conversion for the HubSpot Blog. It's practical, form-based and delivers solutions that a golfer will appreciate. How to Generate More Leads Through a Referral Contest documents how to use the HubSpot platform for a contest. Most car companies offer tools for building your own car. Here is the BMW builder. Here's how to build your own virtual steam shower. Ion Interactive features many examples of interactive assessments. How might you use an interactive content assessment to generate qualified leads? 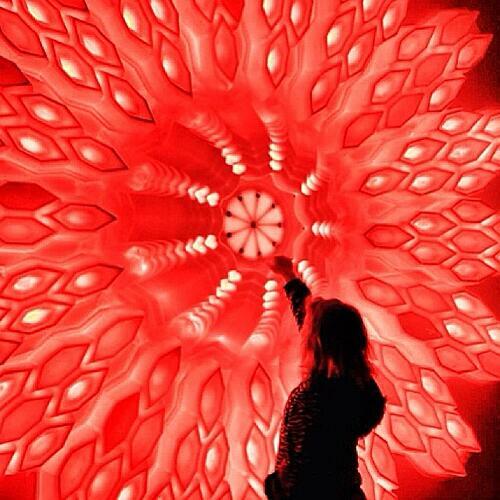 What's your reaction to using interactive content?